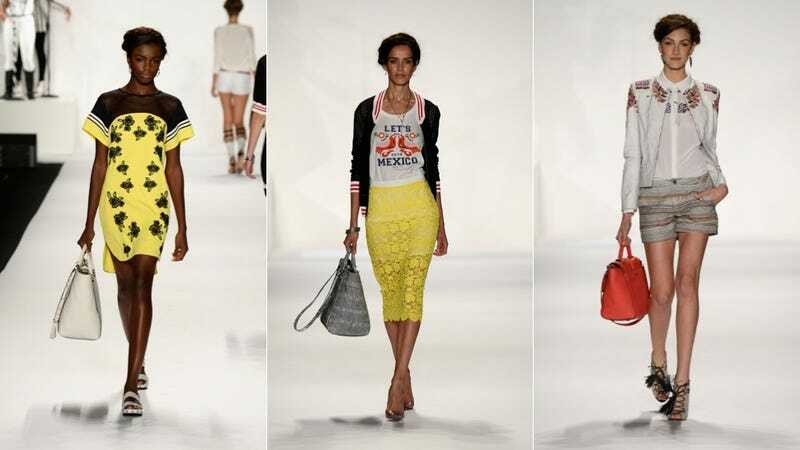 Today as part of New York Fashion Week, Rebecca Minkoff sent her spring/summer 2014 collection down a runway at Lincoln Center, and the clothes were cheerful, bright, graphic, breezy and fun. Janelle Monae provided the tunes! There were pretty florals and embroidered details, as well as lots of white lace, for a slightly earthy/hippie vibe. But with so much black — in addition to complicated, sky-high sandals and sharp bags — it's clear that this collection is for a woman who doesn't believe in roughing it.